The Root of the Presbyterian Apostasy? When church historians evaluate the history of American Presbyterianism, the publication of the “Auburn Affirmation” will stand out in importance like the nailing of Luther’s ninety-five theses on the Wittenberg Germany church door in 1517. Except this Affirmation, unlike that of the German reformer, constituted a major offensive against biblical Christianity. The General Assembly of the Presbyterian Church in 1923 had repeated the earlier high court’s affirmations of five essential truths which made up the fundamentals of Christianity. They were the inerrant Scripture, the Virgin Birth, the substitutionary atonement of Christ, His literal bodily resurrection from the dead on the third day, and supernatural miracles. 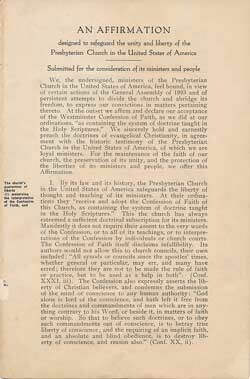 However the very next year, on January 9, 1924, one hundred and fifty Presbyterian elders issued an affirmation in Auburn, New York which stated that these five fundamentals were not necessary and essential doctrines for the church. Eventually the number of ministers to sign it would increase to 1,294 ordained ministers, about ten per cent of the clergy on the rolls of the Presbyterian church. The Auburn Affirmation used many familiar terms on which unsuspecting Christians might be deceived. Thus, it affirmed inspiration, but denied Scripture to be without error. It affirmed the incarnation, but denied the Virgin Birth. It affirmed the atonement, but denied that Christ satisfied divine justice and reconciled us to God. It affirmed the resurrection of Christ, but denied Jesus rose from the dead with the same body in which He was crucified. It affirmed Jesus did many mighty works, but denied that He was a miracle worker. The tragedy of this Affirmation was that not one of its signers were ever brought up for church discipline by their respective presbyteries. This sin of omission hastened the apostasy of the church, as many of the signers would later find placement in every agency of the church. For more on the Auburn Affirmation—the text of the document, along with links to a number of biblically conservative responses—click here. Thanks, Wayne. Sad, sad event in the history of a once God-glorifying denomination. This is what I was baptized into, and grew up in from 1954 till 1977. And it’s far worse, now. Was there to be a link, bracketed after the second paragraph, to a facsimile of the original? It looks like that was the intent, but no link exists, working or broken.